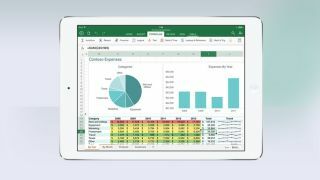 Microsoft has outed a significant update to its free Office for iPad app. The list of features includes Presenter view for PowerPoint that lets you interact with the tablet when displaying a presentation to another screen. That accompanies a wealth of improvements including eraser and pen settings and the ability to edit hyperlinks from within the app. Excel users also get a welcome update in the form simplified interaction with PivotTables, easier grid navigation and improvements around printing capabilities - including more paper sizes. Across the three apps, Microsoft has also added support for third-party fonts, the ability to export content to PDF regardless of whether you have an Office 365 subscription or not and new tools to edit pictures from Office for iPad itself (rather than relying on a third party). The original iteration, which was unveiled in March 2014, needs to be used in conjunction with Office 365 for anything other than viewing. The company made it abundantly clear that the update was done on the back of user feedback and is part of Microsoft's ongoing commitment to deliver continuous improvements as part of an initial "conversation starter".